Trail camera enthusiasts are up for a lot of surprises and improvements with Maxful’s latest product, coming with the most advanced technologies to make their experience more exciting and convenient. The Maxful Wildlife Hunting Trail Game Camera Infrared Night Vision stands out from the outside as it comes with a durable case, guaranteed shock-proof by its manufacturers. Aside from the sturdiness, this camera’s case has a camouflage design for the benefit of the user as well as a size big enough to hold everything needed to make the camera function but not too big to be too noticeable. Also, this camera works excellently with its waterproof feature. When it comes to the functional features, the Maxful Hunting Game Camera has a lot to offer to its users. Among these various features which users can benefit from includes the multi-shot, interval, password protection, serial, timestamp, time lapse, timer and alarm at low battery. This hunting camera is controlled by excellently working and sensitive physical switches, allowing the users to fix the mode with ease. In capturing photos, the Maxful Hunting Game Camera gives its users five different options on how they want to shoot photos and videos. These options include the usual photo, video as well as the Photo + Video, Time Lapse and Motion Detection. Upon choosing the Photo + Video option, users can set the number of photos that they want to be taken simultaneously with the video prior to using it (to record a video). Aside from its ability to do two functions at once, the Maxful Hunting Game Camera also excels in taking high-quality photos any time of the day and even under various lighting conditions. Regardless of whichever mode the user chooses or the time wherein they want to take their photos, breathtaking images and movements of the wild are guaranteed through its swift reaction time and the excellent quality of the lens and megapixels of the camera. These are all made possible through Maxful Hunting Game Camera’s latest addition to its features—the 2.0 megapixels CMOS Sensors, which allows the user to take 720 HD videos with the audio record. Its unique sensor can detect movement within 60 degrees and a distance of up to 50 feet (even for its night vision) and has an improved response time of 1.0 second. To make the Maxful Hunting Game Camera Work, one must simply provide 8 pieces of AA batteries which are promised to last up to six months. One can also hook up the camera with an external power supply for better performance. As for the memory capacity, users may opt to purchase a memory card with up to 32 GB memory. The latest improvements are beneficial to the users since it already gives them good visual and good audio quality at the same time. The alarm at low battery feature offers convenience as it gives the user an advanced reminder to recharge or replace their batteries. This is a helpful feature since cameras simply dying off due to drained batteries have been a common nuisance for trail camera users and this feature will alleviate such incidences. The multiple functions which the users can choose from offering them flexible options. With these features, they can adjust the camera to whichever mode they think would produce the best shots and videos or to whichever function or use seems flexible for them. Aside from the functions, the additional features of this camera offer the best conditions for observation through the photographs and videos. The time lapse and time stamp work well together to give the user data which they may need for documentation and arrive at conclusions. Considering the number of batteries required in making this camera work and the length of time it actually lets the camera work is already a good quality of a camera worth buying and worth keeping. With numerous functions comes the possibility of draining the battery too easily. This follows the idea that if something is required to do more functions or activities, the more energy will be required from it. For example, if the user opts for the Photo + Video features, he or she will be requiring the camera to accomplish tow things—take a photo and a video at the same time. Working on these two functions at the same time and on a regular basis can drain the battery after a short period of time, not making it to the promised six months of battery lifespan. Same goes for the 720 HD video with good audio quality.2. Compared with other hunting cameras available in the market, this camera has a slow trigger speed (1.0 seconds). Considering this, quick motions are not going to be as good using this camera compared with the other cameras in the market with trigger speeds of 0.6 seconds and 0.7 seconds. 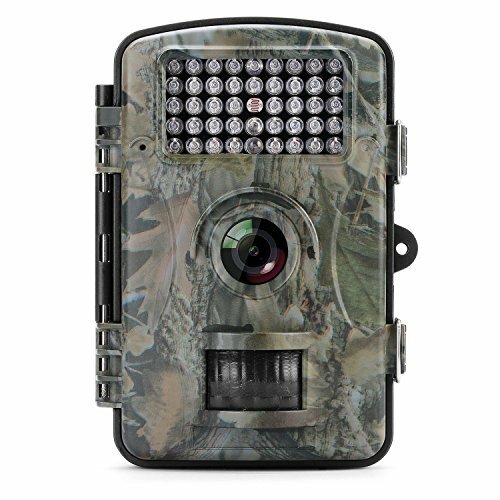 Overall, the Maxful Hunting Game Camera is a recommendable camera for those who are picky about the quality of the photo or video, since it has promising features in producing those. Also, it is recommendable for those who want flexible options for their method of documenting life in the wild. In addition, it is a good camera for those who are not that much into cameras that need too many batteries to work.